Super chlorination is a technique used to clean and disinfect water holding vessels that cannot be washed in the traditional sense. This is different from your standard disinfection, which is for cleaning the water, not the container. Super chlorination is used when reservoirs become contininated with microorganisms or have been emptied for any reason (indicating possible esposure to contamination). Super chlorinating is simple. On a very basic level, it is just adding a large amount of chlorine to a reservoir either as a wash applied directly to the wall or as a very strong chlorine/water solution which fills the entire reservoir. On a more specific level, it is dependant on the strength of the hypochlorite and the amount of time the chlorine is left in direct contact with the container. The stronger the chlorine the less time required. For example, if you decide to spray the walls with straight 10% sodium hypochlorite then there is almost no time required. Whereas the normal chlorine levels in most municipal drinking water systems is not enough to ever disinfect the vessel it is in. Those low levels of chlorine will only protect the water from contamination in a reservoir that is already free of contamination. Now you might be asking how to figure out how much chlorine to add to make super chlorinated water. If you think all you need is to dump a large amount of chlorine in then I will point out that releasing large amounts of super chlorinated water into the environment is illegal in most jurisdictions. So it is necessary to calculate how much dechlorinating agent is needed. The easiest way to know the dechlorinating needs is to measure the amount of chlorine added. In order to save money or time it is best to calculate the ammount of chlorine necessary. 50 mg/L (50 ppm) of available chlorine is a great place to start. 50 mg/L left for 24 hours will meet the best pratices and standarized procedures for most jurisdictions in North America. Below is a table outlining how much chlorine you need to add for various volumes of water. From this chart you can see exactly how much chlorine to add. Add the hypochlorite solution when the system is haIf full. Then fill the tank or reservoir the rest of the way with clean water. If you are disinfecting something with plumbing, like a building or a boat, then make sure the super chlorinated water makes it to each cold water faucet by flushing until you can smell chlorine (or can measure it). Do not flush the hot water faucet. all you will do is waste chlorine and hot water. This procedure will disinfect any reservoir. Regardless of the levels of bacterial contamination, because if it doesn’t work the first time repeat the process until it does. The most likely culprit if super chlorination doesn’t work the first time is that a pipe connected to the tank wasn’t flushed completely. Whether you have a large tank of reserve water or your rain barrels start growing dangerous microorganisms, you may need to super chlorinate one day. Water systems are distributed networks of pipes, pumps and reservoirs. Like all distributed networks they can be very difficult to protect from vandalism and terrorist attack. There are two broad types of attacks that could hit a water system. The first type is an attack on the quantity of water available (physical supply) and the second is an attack on the quality of water. The end result of both types of attack is a lack of potable water entering your home. The greatest defense for a water system is that most of it is underground. It is very difficult to access most parts of water distribution systems. Even for the operators of the system it is time consuming and disruptive to the wider community. If anyone unauthorized to dig in a road to access a watermain they will be reported to the authorities in the form of complaints about traffic or noise. I think it goes without saying that depending on public complaints to defend against terrorism is nowhere near secure. The exposed parts of water systems are water treatment facilities, reservoirs and fire hydrants. These are the points where the system is at the surface and easily accessible. These different points also offer different security concerns. Treatment facilities are as secure as any factory or industrial facility will be. The treatment facility I work at is always locked and there are a limited number keys. Then there is an electronic alarm system which brings a human on site if there is an intrusion alarm. There is also a human dispatched if the communication link is broken. A large city water treatment facility will most likely be manned twenty-four hours a day. The biggest weakness here is that properly armed people can force their way in and destroy the building if they so desire. 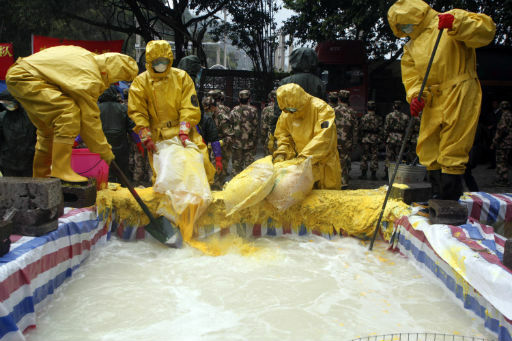 Or they can contaminate the reservoir on site (if they know how). Reservoirs of treated water are next most likely place for a terrorist attack. The biggest weakness here is that reservoirs are almost never manned during the day. They will be visited most days, but rarely will people be there all day. The good news is that water in reservoirs is monitored constantly(usually) with automatic analyzers. Reservoirs can be destroyed, and the water within wasted. Or the quality of the water can be destroyed this is where chemicals could be added easily. The remaining pieces of the system are fire hydrants. Fire hydrants pose a unique risk to water security. It is very easy to add chemicals to a fire hydrant. It is however not easy to get that chemical into the water supply. This is because of the construction of the hydrant itself and the pressure in the system. There is a valve at the bottom of the hydrant which isolates the water. In order to add chemicals to a fire hydrant you also have to lower the system pressure which is rarely easy to do undetected. At this point I want you to remember the scene in Batman Begins where Sandman is dumping his psychotropic drug into a cracked watermain. I don’t expect realistic depictions from the movie, I do however want you to know this is nowhere near realistic. Watermains are pressurized, when they crack water shoots out at anywhere from 50 to 100psi. This is enough to erode foundations of buildings and the all soil around the break creating massive sinkholes. It is not something you can pour chemicals into. This is what it looks like when watermains break. Just adding chemicals to water, is not as effective as it appears on the surface. Most water supplies contain residual disinfectants, usually chlorine. Disinfectants are highly reactive chemicals, they aren’t limited to just killing bacteria. Highly reactive chemicals often react with other chemicals. I am obviously oversimplifying the chemistry involved, but it is true that a large portion of any chemical added to water will be consumed by the chlorine in the water. Cyber attack is another way water systems are vulnerable. You may wonder why water treatment facilities are connected to the internet and the answer is for remote monitoring and control. It may seem like an unwarranted risk having these facilities connected to the web. It is not an unwarranted risk at all. The likelihood of the automated system needing an intervention that cannot wait for someone to be onsite is greater than a targeted cyber attack. 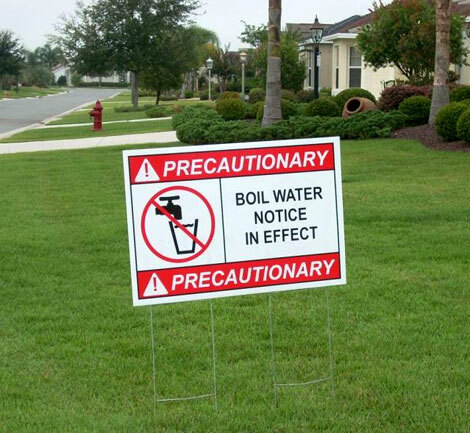 Keep in mind that even normal breakdowns of the watersystem can cause illness and even death. These need to be responded to and are just as important as preventing cyber attack. I am not a technology expert so I will leave it to other people to suggest the best firewall setup. Another thing to note about cyber attack on a water treatment facility is that even if the attacker is successful and shuts down the control computer, the facility can still be controlled manually. Terrorism is something that needs to be addressed when it comes to water systems. People inside and outside the system need to be aware of the risks and what can be done for protecting the security of out water. Lead (Pb) In Your Water? I get asked a lot of questions about lead in water supplies. Questions like how dangerous is it? Or how much is present in their water? Or where does the lead come from? And what can individuals do to remove lead from their drinking water? Since lead can cause brain damage when ingested, these are all very important questions that need answers. Be careful of the dates in this article. They will vary largely depending on where you live as different jurisdictions banned lead at different times. Another thing to note is that on average drinking water only counts for 20% of American’s lead exposure (according to the EPA) and total exposure is what causes health problems. Lead can be very dangerous in water supplies. If consumed in large enough quantities it can cause severe brain damage, kidney damage, anemia and there is some evidence that lead can cause high blood pressure. Compounded on this brain damage is what happens to the larger community if everyone is drinking lead contaminated water and significant percentage of people are suffering from lead poisoning. Costs for healthcare (monetary or increasing disease) increase significantly with lead exposure and with that a decrease in quality of life. They younger you are the more lead exposure affects you (including before you are born). This is because growing children absorb more lead from the food and water they drink. Also because they are smaller, they can hit toxic levels sooner. Finally, lead has a cumulative effect on the body. Your lifetime exposure determines if there will be any negative health effects. Some lead will remain in your bloodstream for the rest of your life, and most will end up in your bones. If you are on a large municipal system there is a good chance the monitor for lead. In Ontario, Canada, the Provincial government forces every municipal system to test for lead twice a year throughout the system. 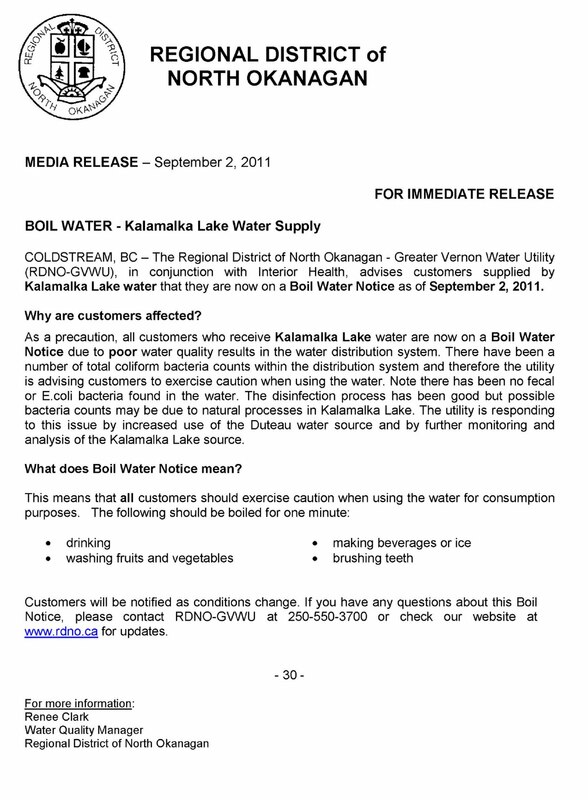 Any sample that exceeds 0.010mg/L will be reported immediately to the local health unit the ministry of environment. The resident will be informed shortly thereafter. If you are curious about lead levels you can find the results in the Annual report for the municipal water system. If you are more proactive you may even be able to volunteer your home as a sampling point for a lead testing. Failing that you can always send a sample to an environmental laboratory. Calling your municipality will get you the information of what they are doing to control lead. They have more options available to them than any individual does. Lead gets into water supplies in three main areas. Into the source water from natural deposits or from lead based pollution. Finally, and by far the most significant source of lead is from plumbing with lead based metal fittings. Many alloys contain lead. Even lead free metal fittings can still contain lead and even buying top quality fittings still poses a lead risk. Any solder made before 1986 likely contains lead, sometime upwards of 50%. If you live in an older home (pre 1930’s) there is a chance that you have a lead service connection and possibly lead plumbing. Homes less than five years old also can have lead problems because the water has not coated the internal plumbing with scale. Scale is a build up of minerals on the wall of pipes and reservoirs that physically separates the water from any potential lead. Lead was used so frequently because it is very easy to form into useful shapes. Shapes like pipes, valves and curves. Lead is very soft, that’s my it can make so many useful shapes easily. Lead on it’s own is often too soft for retaining the shape you want, especially if there is any stress on the metal. However mixing lead with other metals like brass, make the brass easier to work with and give the lead more rigidity. Copper was mixed with lead a lot less often then other soft metals. This is one of the reasons pipes were switched to copper. However fittings are still often made of brass because it is easier to make complex shapes like valves in brass. Remember that even “lead free” brass still has some lead in it. Because lead is in older solders, flux and metal pipes, most of the lead enters the water while sitting in the household plumbing. Typically overnight when the water sits still in the pipes for at least a few hours. Lead needs time to be absorbed into the water (or leached from the metal). The longer water touches anything with lead in it the more lead enters the water. 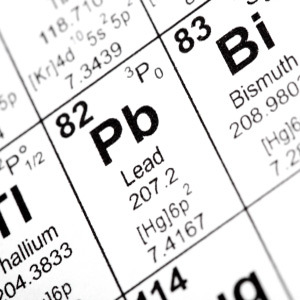 Lead absorption is also influenced by pH. The lower the pH (more acidic and therefor more corrosive) the greater ability the water has to remove lead from other sources. Raising the pH will help reduce the amount of lead that leaches into your water, it will also encourage scale formation. You can mimic corrosive water by grounding electrical systems to metal plumbing. Grounding electrical systems to your plumbing is bad for your plumbing and helps lead enter your water. BUT PLEASE GROUND YOUR ELECTRICAL SYSTEMS SAFELY AND ACCORDING TO CODE. Temperature also affects lead absorption. The hotter the water the more likely there will be lead in the water and the water’s ability to carry water increases. So what can you do about lead in your water? First, get your water tested. Knowing there is a problem is essential because you can’t see, taste or smell lead dissolved in water. Second, always flush until the water is as cold and stops getting colder. 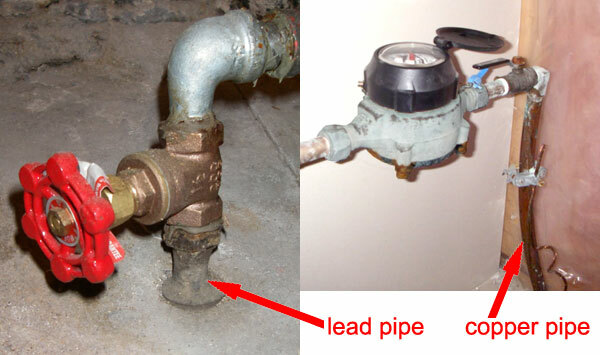 If your home is older than 1930 and you don’t know for sure that your service connection isn’t lead then flush for an additional 15-30 seconds to make sure you are getting water from the street. This flushed water doesn’t have to go to waste. It can be used for non-consumption purposes like washing and gardening. Flushing may not be a viable option for you if you live in a high rise building as the pipes may be too large for you to flush economically. Third, never use the hot water tap for consumption purposes. It is better to boil cold water if you need hot water. Lead affects children and pregnant women significantly more than it does grown ups. Small amounts of lead that are harmless to a adult, can be highly toxic when introduced to smaller bodies. You can buy a water filter that is capable of removing lead from water. If it is not specifically designed to remove lead then there is a good chance that it doesn’t remove much lead at all. Because lead has been such a big issue in the past, there are a lot of fake and ineffectual “lead” filters out there. Double check the manufacturers claims with independent information or get the water tested. Don’t forget to change the filter often otherwise you will expose your water to VERY high levels of lead. What do you do with your unused and expired medications? How do you get rid of used motor oil and solvents? Your painting is done but you have some paint left over, what do you do with it? Many people will say “I pour it down the sink or flush it down the toilet”. Even more people will lie when they say they don’t put it down the drain. Your drains are not garbage disposals for all our waste. Doctors usually recommend that expired medications get flushed down the toilet. This line of reasoning is to prevent children and pets from consuming the drugs. Maybe a doctor can expand on their reasoning more, the purpose of this article is to make a case for why using the toilet to dispose of medication is a bad idea. Why is dumping things down the drain such a bad idea? The answer is both simple and complicated at the same time. The simple answer is that everything that goes down the drain in whole or in part survives long enough to make it back into drinking water supplies. 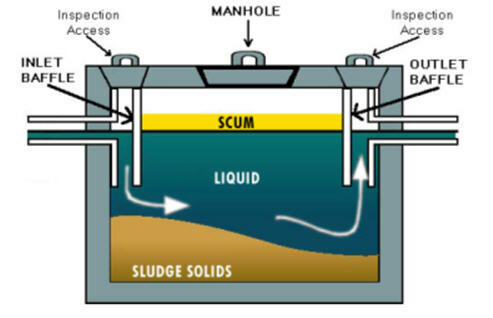 The long answer is that contaminates survive the sewer and waste water treatment and are released back into the environment with the treated water. Then the lakes and rivers are used for drinking water. The contaminants survive the drinking water treatment and enter our drinking water. Most of these contaminants survive because the largest part of waste water treatment is biological. Therefore, anything non organic will either pass through the treatment or disrupt the treatment process or become part of the biological organisms that are there to break down waste. In either scenario, and really all scenarios happen all the time, contamination enters the environment. In 2011, a shipment of municipal biosolids from Ottawa, Ontario, Canada was refused at the American border. The biosolids are supposed to cross the border for disposal. This shipment was refused due to radioactivity. The radioactivity came from cancer patients as the chemicals from chemotherapy pass through the body and the wastewater plant all while remaining radioactive. Radioactivity is easy to detect and in this example the chemicals came from people’s bodily waste which is supposed to go down the drain. I only mention this example because it so clearly outlines how persistent many chemicals can be. Some chemicals mimic our hormones and disrupt our natural body systems. They have been found to cause feminization of fish and are believed to cause early onset of puberty in humans. These chemicals can come from people’s medication and from all our waste. BPA is the most famous hormone mimic. It come from the breakdown of plastics and mimics estrogen in humans. Other pharmaceuticals tend to do what they are designed to do, just now they are affecting the wrong people. Most other chemicals just cause cancer. This contamination isn’t limited to water. Earlier I mentioned that the chemicals can enter organisms. This is especially true of plants. Plants will absorb these chemicals and then they enter the food chain. I won’t describe the food chain here, all you need to know is that the concentration increased the higher up the chain. This is called biomagnification. The apex predators get poisoned first. The main problem with biomagnification is, we are the species that eat the most other animals. There was a study in Scanadnavia that found flame retardants in cancer patients. They traced the chemical back to the bread they had all eaten. Then back to the wheat in the field where biosolids were spread. The flame retardants were found in the municipal wastewater facility and the municipal sewers. It was traced back to one manufacturer who was putting flame retardants down the drain as part of their process. I can tell you this happens everywhere. Even if you live on a remote septic system, there is always someone upstream. Hardly seems worth it for dumping chemicals down the drain. You might be wondering why this matters to you. Simply, it matters because we all have a part in what we put down the drain. This is true whether you live in a large metropolitan area or a remote cabin on a well and septic system. What we release into the environment comes back at us in many different directions. Detecting these chemicals is difficult because there are so many different chemicals out there that nobody can check for them all or even most of them. A lot of these chemicals pass through store bought filters. Many of these molecules are smaller than the water molecule. That means every filter is ineffective against them. To put is simply, this problem affects everyone.